TSKgel UP-SW3000 columns are designed for the analysis of monoclonal antibodies and other biopharma products and can be used on both HPLC and UHPLC systems. The columns are packed with 2 μm silica-based beads shielded with a hydrophilic diol-type bonded phase that prevents the silica surface from interacting with protein samples. TSKgel UP-SW3000 columns feature the same pore size as the well-established TSKgel G3000SWxl columns. 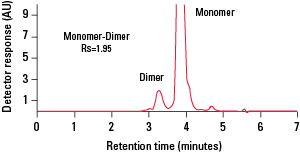 Hence methods developed using TSKgel G3000SWxl columns can easily be transferred to TSKgel UP-SW3000 columns on conventional HPLC systems as well as on UHPLC systems. 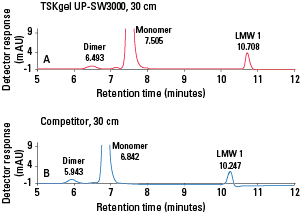 TSKgel UP-SW3000 columns offer higher resolution, improved peak shape and increased efficiency yielding methods that are robust, reproducible and easily transferrable between UHPLC and HPLC systems. 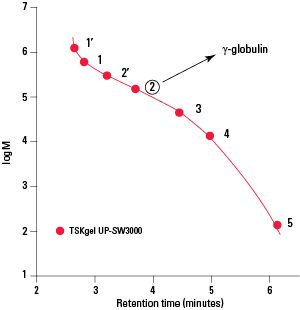 TSKgel UP-SW3000 columns offer superior reproducibility injection-to-injection, from column-to-column within the same lot and from lot-to-lot. %RSD values for peak parameters including retention times, area peak height, peak asymmetry, and theoretical plate count demonstrate the exceptional reproducibility of these columns.